Strawberry Banke or Strawbery Banke? Though our contemporary spelling is strawberry, the earliest settlers in 1630 named this area of Portsmouth New Hampshire "Strawbery Banke", so that became the name and the correct spelling of this jewel of a New England living history museum. This museum is unique among outdoor history museums because it is an authentic neighborhood, with most of the 42 historic buildings on their original foundations. The earliest structure in the neighborhood dates to 1695. Some of the houses have been restored and furnished to particular periods in the past; some are used for exhibits on such special themes as architecture or archaeology; still others serve as shops for artisans practicing traditional trades. The 9 acre museum also offers a rare opportunity to experience garden history in an original waterfront neighborhood. The museum preserves nearly four centuries of original gardens and was recently recognized by Garden Design magazine as one of four sites in the world teaching about change over time in the landscape. These gardens bring new life to the ground where generations of immigrants helped to create the unfolding story of America. There's plenty for the kids to do and see here. The Jones House Family Discovery Center gives children three large indoor rooms and an outdoor play space. 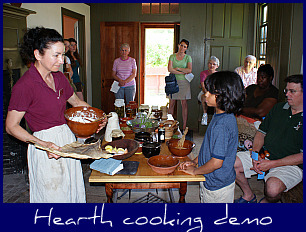 They can explore cooking, chores, and home technology in the "Home & Hearth" room. Two recreated kitchens - a colonial open hearth and a ‘modern' 1940s kitchen - give kids a place to try cooking equipment that their grandparents and great-great grandparents might have used. Or they can play shopkeeper or shopper, selecting fabrics and bulk spices from the Colonial-era store, or canned goods and Victory Garden seeds from the 1940s-era corner store. They'll have a chance to learn the basics of shipbuilding and try a cooper's tools. A real old-fashioned fabulous 4th of July! Complete with children’s parade, traditional games and crafts, historic garden tours, music, living history, and food. And there are fireworks over the Mill Pond that night, so spend a whole day and evening in wonderful Portsmouth New Hampshire! Lamplight Dialogues: The Ghosts of Puddle Dock Come To Life. 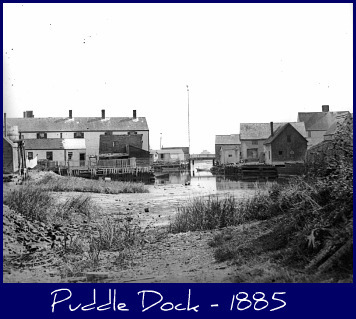 Visit the ghosts of Puddle Dock as they truly were. In the parlors before the fire or around dining tables by candlelight, their stolen secrets, haunted pasts, and family feuds and reconciliations will play out on their original stages. Named Best of NH Editor's Pick for Best New Festival. Celebrate harvest time at the third annual New Hampshire Fall Festival. Come enjoy four centuries of traditional home and farm harvest festivities and experience a traditional New England country fair like no other! Come and meet the Ghosts on the Banke at the famous Halloween celebration. Long-dead sea captains, 17th century shopkeepers and wayward pirates haunt the streets of Portsmouth’s oldest neighborhood as you trick or treat safely from house to historic house. Stroll through life in a simpler time as 350 years of American history, winter traditions, and holiday celebrations unfolds around you in New Hampshire's oldest waterfront neighborhood. Bring the whole family for a wholesome candlelight stroll through the sights, sounds, and smells of New England's favorite holiday season. Please visit the Strawbery Banke web site, where you'll find details on admission, directions and much more!